When I was younger, I loved going to the park and could spend hours upon hours there begging my mom for more time on the swing or teeter totter. Now, it’s my two year old daughter who pleads, “Five more minutes Mommy, please,” putting up her little hand displaying her five fingers. Occasionally, I give in, and in return, my daughter often teaches me a life lesson at the park. 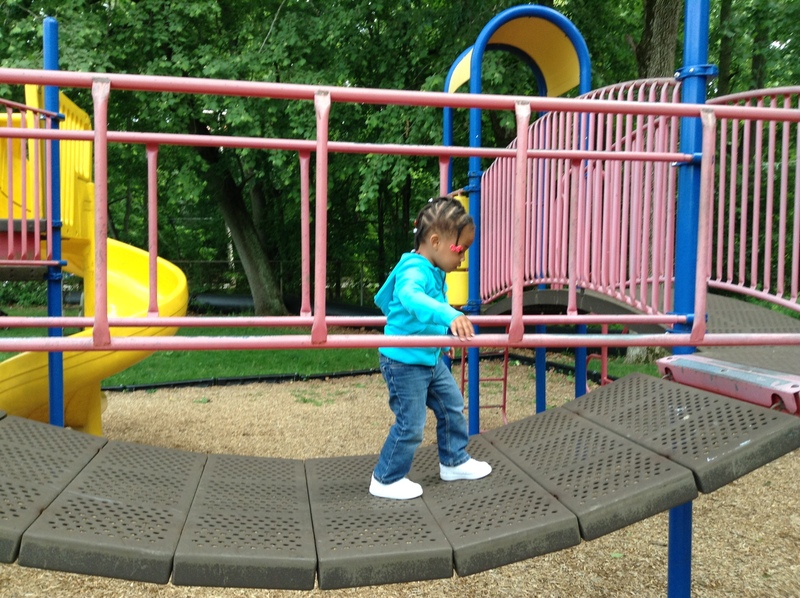 My past two blog entries this week have been about crossing bridges and the power of the slide. Today, it’s all about having fun with the equipment you’ve been given, endurance, and putting those fears aside. One day, months before Quinn’s second birthday, she prepared to go down the slide but then stopped and observed the metal bar a little above her head. It must have reminded her of the bars she uses at The Little Gym because she quickly grabbed hold of it with both hands and began to swing. My heart began to race. While I was amazed at how well she was holding on (even better than she does at The Little Gym which has protective mats), I was nervous that she would either realize the riskiness of her “gymnastic routine” and get scared or lose her grip and hurt herself. Rather than tell her to stop in a panicky voice, I just stood as close as possible and softly told her to be careful, and she confidently said, “I be careful Mommy.” She squealed with excitement awaiting my applause, which I, of course, granted her as the fear in my heart turned into pleasure. If only more adults, including me, could be more like my daughter: having fun with the obstacles put in front us, casting our fears aside and just going for it! 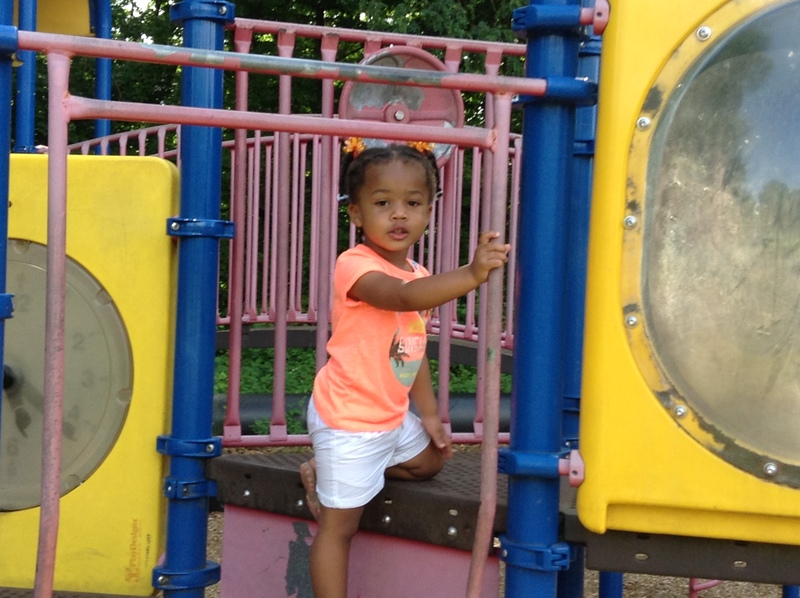 At least four to five times a week during the summer, my two year old daughter and I go to the park, and at least four to five out of these times we visit the park, I learn a life lesson from her. Yesterday, I posted a blog entry on the bravery it takes to cross bridges. Today, it’s all about the power of the sliding board, which my little girl enjoys. Sometimes she zips down quickly. Other times she purposely inches down little by little, trying to make the trip down the slide last as long as possible. Lately, she takes pleasure in being a dare devil: walking down or up the slide and sneakily trying to slide head first if I don’t stop her first. As I told her one day, “Quinn, slide down the right way. You’re not supposed to walk on the sliding board,” the memory of me having fun, walking up a sliding board immediately flashed in my mind. How dare I deny my child her fun? Is it always about following the rules or using something solely for its initial purpose. Climbing up the slide instead of taking the stairs might seem like merely a shortcut, but it forces her to exert herself more as the incline, slippery slide and gravity are the forces pulling her down as she tries with all of her might to go up. There are times when the slide of life or what appears to be fate is pulling me in a certain direction. As most people will say just go with it and slide on down, I still have choice. When I looked at Quinn’s face as she made it back up the slide, I saw her sense of accomplishment which far outweighs the joy she gets from actually going down the slide. Who knew such a big lesson could come from my little girl? Thanks so much sweetheart! I hope others will benefit from your lesson. 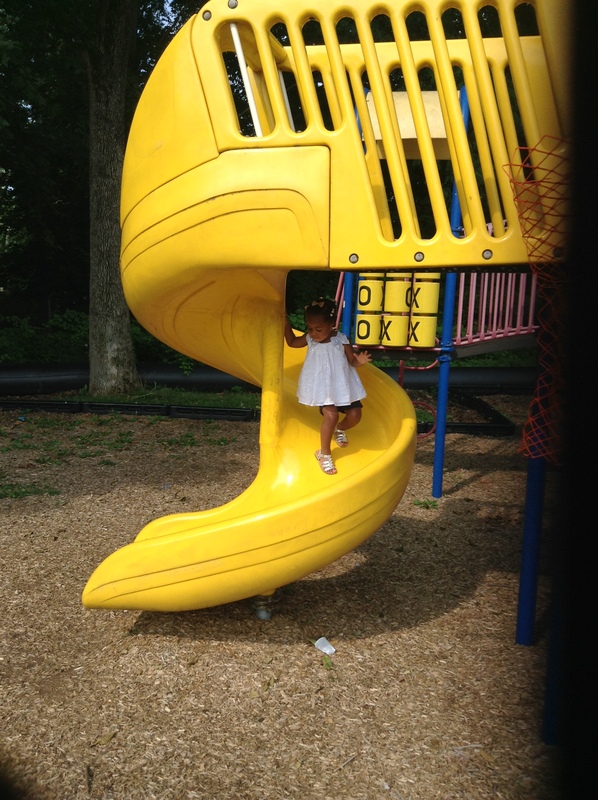 Most children love going to the park, and my little girl is no different. She enjoys running, jumping and playing on the different equipment, and I love seeing how motivated and determined she is when facing any obstacle. In simply observing her, it occurred to me that while she’s having fun (of course I have fun interacting with her too), she is learning and teaching me quite a few life lessons. One of the parks we go to has a bridge. When Quinn initially came across it, she was hesitant, possibly because it seemed long to her or was a little shaky. She asked me to go across with her and to hold my hand, but about midway across she eagerly wiggled her fingers out of my grasp and went the rest of her way by herself, excitedly saying, “I cross the bridge Mommy!” I was probably more nervous than her but so proud of my brave little girl, who wasn’t quite two at the time, for not letting the obstacle of the bridge intimidate her and stop her from getting to the other side. Since then she prefers to go across without my assistance, but if she observes another child, usually older, jumping and shaking the bridge, she has enough common sense to wait until it is safe. When I think about the obstacles I’ve faced in life, there have been many occasions when I faced a bridge I needed to cross to reap the benefits of what was in store for me on the other side, but there were times when I allowed the bridge and the thought of its instability to intimidate me, making it take longer than I would have liked to cross it. Quinn has taught me that being brave enough to cross that bridge sometimes requires a support system to get us started. While she wanted to cross the bridge, she felt more comfortable knowing that I was there with her. Oftentimes, adults, including me, feel that they must do it all by themselves and think relying on support is a sign of weakness, but I have learned from my little girl that as long as the support can get me started, it will be my own determination and bravery that allows me make it across. Time for the Big Girl Table! My Little Girl is Growing up! Alas, I knew this day would come. I even prepared for it by purchasing a Kid Kraft table with chairs that resembles my own dining room set as one of the gifts when my little girl turned two so that she feels like a big girl. 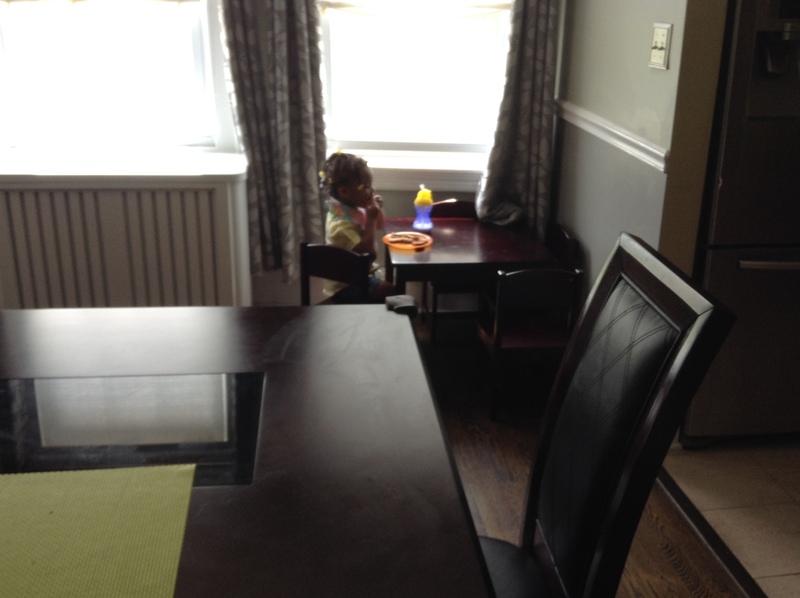 While some children want to sit at the big table because their older siblings do or it is the way it is done at daycare, my little two year old is an only child who is not in day care, so she was content with sitting in her high chair until I introduced her very own table and chairs set. While sitting at the table may not seem like a big deal to her, outside of the joy she gets from looking out of the window, it is to me. My little girl is no longer a baby, and while I want the best for Quinn and am wiling to do what is necessary to promote her independence and development, part of me misses my baby. Though I now can get a couple of tasks done while she is eating, I actually miss making silly faces at her to get her to eat and assisting her with holding the spoon to get those sweet potatoes or mashed bananas into her mouth. Of course, it is wonderful that she now can feed herself and eagerly runs to her table for breakfast, lunch or dinner, but my little girl is growing up so fast leaving me wondering where the time went. 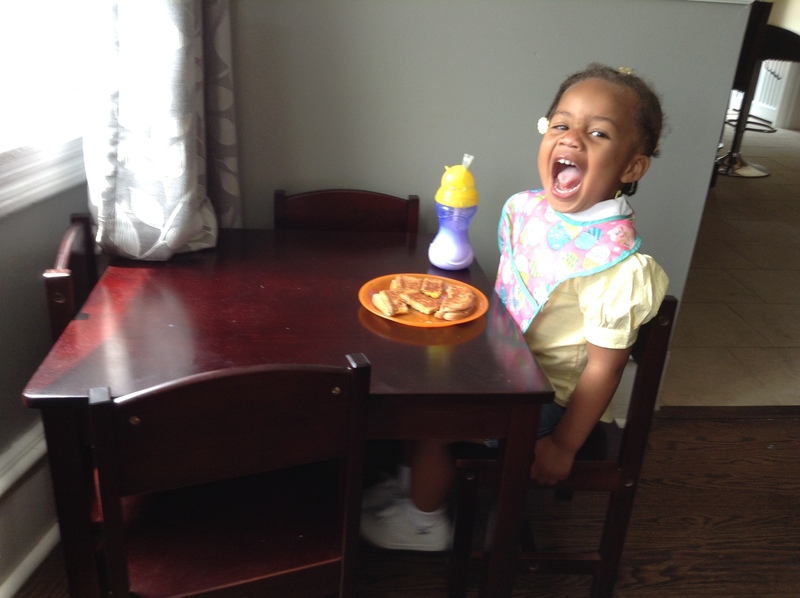 Before I know it she’ll be moving from the “big girl” table to the actual dining room table. It’s amazing how one milestone is able to make me not only appreciate the time I have with my daughter but be excited with how well she is progressing into toddlerhood. Here’s to many more milestones to come! “We go to Sesame Place on Saturday! We go tomorrow!” my two year old giddily tells her older cousin. Her cousin then came to me, “Auntie, are you really going to Sesame Place tomorrow?” I smiled with pleasure and said, “Yes, Quinn’s right! We’re going tomorrow.” My smile was in part because of the joy Quinn gets from going to Sesame Place but also because the resource I purchased for her a little over a month ago to further grasp the concept of time, days of the week, seasons, etc. is really working. Since Quinn is not in day school, she does not have circle time where the teacher usually goes over the day of the week, weather, activities of the day, and so on. So I knew I needed to do something so that my little girl would be on target, not just for school but so that she can have the vocabulary to further articulate herself. 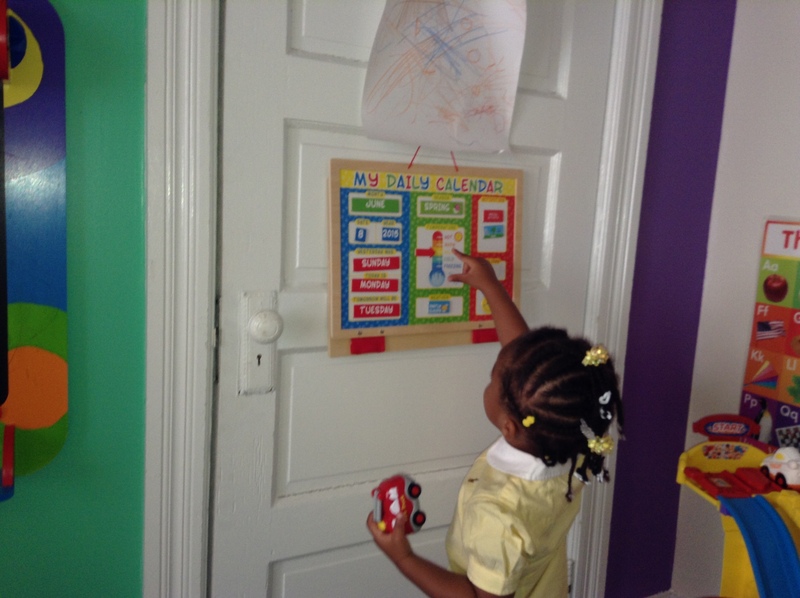 As soon as we enter her playroom, she’ll immediately runs over to the her “My Daily Calendar”board, created by Melissa and Doug. One section she loves is the face to indicate her mood. Sometimes she will put the happy face in the board and say, “Today, I’m happy.” Or she will put on the face that has a tongue sticking out and say, “Today, I feel silly!” Sliding the arrow up and down to indicate the temperature is another task she enjoys, and of course going over our activities for the day is another. This section also forces me to follow through with our activities. For example, if I say we are going to the park and display it under activities, I better make sure we get to the park because I’ll never hear the end of it. “We go to park, today! It’s Wednesday. We go to the park!” Quinn says until we get there. The only issue I have with the activity board is that I did not purchase it sooner through Amazon. If you are looking for a way to not only teach your child the days of the week, month, to discuss his or her feelings, the weather, etc., this is perfect! 1. 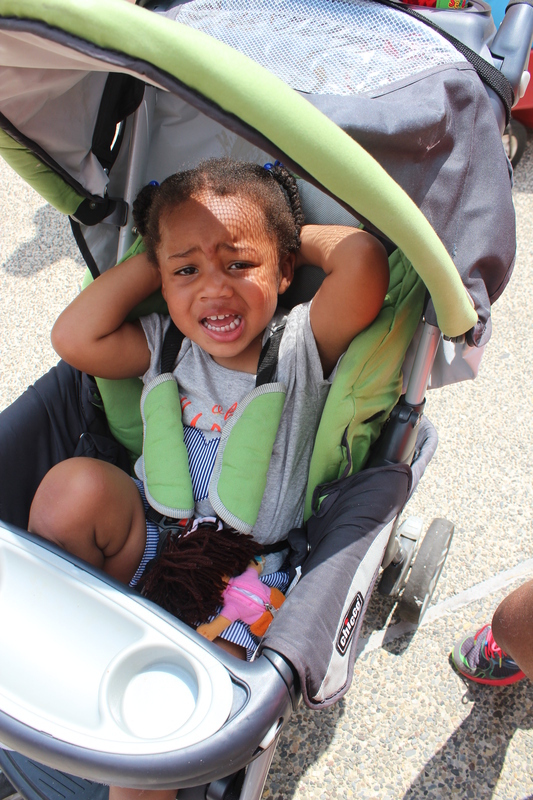 Give your little “no-gotiator” the impression that she has a choice. For instance, my toddler is getting more and more picky when it comes to food and what she wants to wear, so I will often select two outfits I want her to wear then ask her which one she wants. She’s very happy when she gets to wear what she picks out. 2. Appeal to her emotions. Though this one does not work as frequently as I would like, it is a good way to get her to develop a sense of empathy. Those times when she yells out no, simply ignores me or refuses to do what I am asking, such as putting away her toys after playing with them, I will tell her how happy it makes me when she follows directions and that I like it when she listens. I will usually put on my sad face so that she can see that I am clearly disappointed that she is not doing what she was told to do. 3. Positive Reinforcement. I make sure to, not overly praise but acknowledge when she listens and does not put up a fuss the first time I ask her to do something. For example, Quinn has a Dora the Explorer electric toothbrush she loves using. She loves it so much that she will say, “no” and run away when it is time to stop brushing her teeth. Whenever she hands over the toothbrush willingly, I let her know that I like how she follows directions. 5. Realize that your “no-gotiator” may be more persistent than you think, and consider if the battle is worth it. Getting my little girl to try new healthy foods is becoming a struggle. Just the other day, she cried hysterically and refused to eat her veggie pasta. There was no negotiating with her. She would not eat even one bite: even after offering her a special treat if she did. Having her sit at the table and cry hysterically beyond a half hour did not help either of us, but after she calmed down, I did appeal to her emotions in hopes that she will try something new in the future. P.S. Another tip is that nothing works 100 percent of the time, and I’ve learned not to beat myself up too much when my little “no-gotiator” is unwilling to compromise. If you have any other tips, please feel free to share.